World shares fell and were set to end the week in the red on Friday while the dollar climbed to a seven-month high, as investors braced for a list of Chinese goods targeted in a first round of announced tariffs by the United States. The MSCI All Country World index, which tracks shares in 47 countries, was down 0.2 percent in morning trade in Europe and set for a weekly loss. U.S. President Donald Trump has decided to impose “pretty significant” tariffs and will announce a list targeting $50 billion of Chinese goods on Friday, and a second wave of products worth $100 billion has been cued up. Beijing has warned that it was ready to respond. 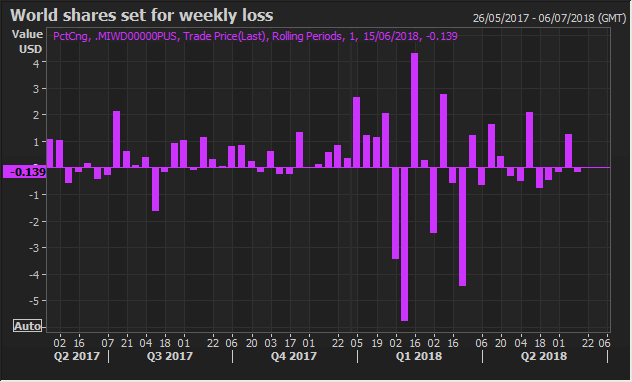 The euro was headed for its worst weekly loss in 19 months after the ECB signalled interest rates would be left at record lows into at least mid-2019. The common currency shed 1.9 percent to the dollar, its biggest daily decline since Britain voted to quit the EU in 2016. “I think the biggest concern at the moment, more than talk about trade, is the tightening of monetary conditions in emerging markets caused by a stronger dollar,” said Michael Hewson, chief markets analyst at CMC Markets in London, noting the Federal Reserve’s forecast for a total of four interest rates in 2018. Boosted by the ECB’s announcement and positive comments on the euro from politicians in Rome, Italy’s government bonds were on course for best week since Mario’s Draghi’s “whatever it takes” Outright Monetary Transactions programme was created in September 2012 [GVD/EUR]. Oil prices were little changed as investors eyed a key OPEC meeting in Vienna. Saudi Arabia and Russia, architects of a producer deal to cut output, have indicated they want production to rise [O/R]. West Texas Intermediate (WTI) crude oil futures were down 0.2 percent at $66.76 per barrel; Brent was down 0.6 percent at $75.49.